Photo Courtesy of Gladstone Volunteer Fire & Rescue: Left to Right – Stephen Rea, Thomas Jefferson EMS Council Executive Director, Jennifer Burks, Gladstone Vol. Fire and Rescue Service, Member, Mary Kathryn Allen, GVF&RS Captain, Jim Allen, GVF&RS member, and Chief Curtis Sheets, Wintergreen F&R and President of TJEMS are all smiles this past Wednesday night – May 8, 2013 after Gladstone Fire & Rescue received Outstanding EMS Agency within the region. 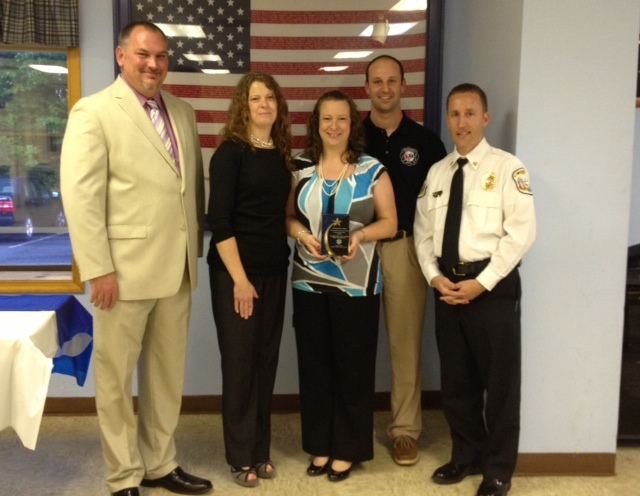 The award was presented during a ceremony at the Lake Monticello Fire Department in Fluvanna County. Gladstone is now in the running for the state award in November. Not long ago Gladstone was going through some dark times. After the old fire & rescue lost it’s charter a couple of years ago after some improprieties discovered, today they have emerged under a new charter and were just named Outstanding EMS Agency within the Thomas Jefferson Emergency Medical Services region. “Our community was in desperate need of local EMS service. The fire dept stepped up and decided to form a combined fire and EMS system,” said Mary Kathryn Allen, a captain with Gladstone Fire & Rescue. “Gladstone Fire Department reincorporated last year so they could provide EMS services to their remote corner of the County. After the Gladstone Rescue Squad closed, the community of Gladstone went for nearly a year relying upon ambulance responses from Lovingston and beyond. Instead of an “okay we’ll do it” attitude, they charged forward with an attitude of “we’ll do it better.” They licensed the agency as an Advanced Life Support and acquired all of the associated equipment. Until this point, Gladstone had only been served at the Basic Life Support level,” said Curtis Sheets, President of TJEMS. Sheets is also the Chief of Wintergreen Fire & Rescue. He also received outstanding EMS Administrator in the region during the ceremony in Fluvanna County last Wednesday evening. Congrats to everyone in Gladstone!